Flashy Spiral String Art Earrings add sparkle to your wardrobe. Wear these unique earrings with a belly dancing outfit. Approximately 3.75 in. 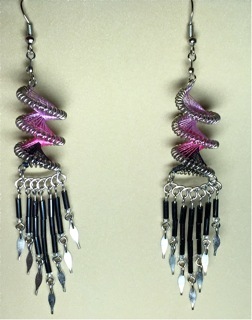 long, with rose, lavender, and black on silver color wire, with black beads and silver-colored dangles. Colors have important meanings in chakras. Save time and money buy purchasing these ready to wear classy earrings for any occasion.